Cost Optimization Programs are hard to manage, sustain, and often tend to fall short of delivering the promised value. 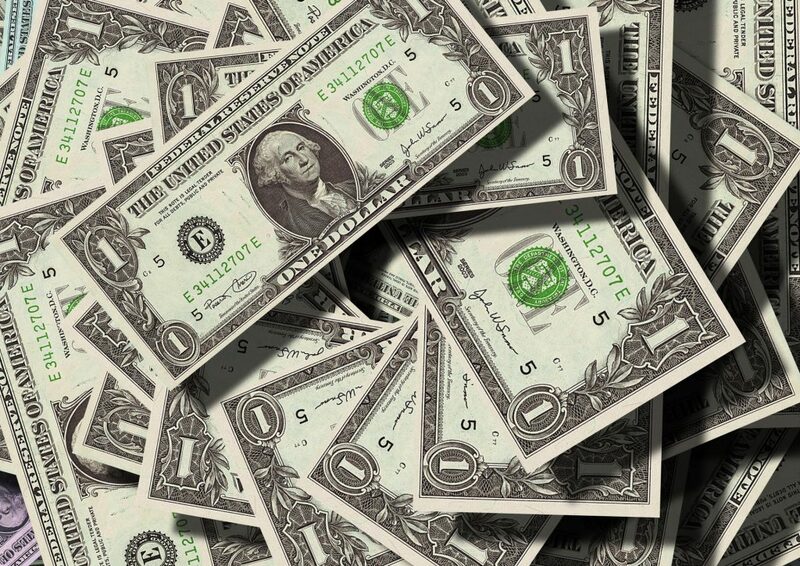 The failure could be attributed to many reasons—inclu http://flevy.com/blog/wp-content/uploads/2019/02/dollar-currency-money-us-dollar-47344-768x543.jpeg 768w, http://flevy.com/blog/wp-content/uploads/2019/02/dollar-currency-money-us-dollar-47344-1024x724.jpeg 1024w" sizes="(max-width: 300px) 100vw, 300px">ding lack of clearly delineated objectives, failure to account for the operational difficulties, internal resistance to change, trying to cut corners from everywhere, not paying attention to planning optimal utilization of resources; lack of direction, accountability, and management agreement. However, the tremendous pace of technological disruption, today, offers new opportunities to transform enterprises by eliminating complexities, transforming the strategy and cost disciplines, streamlining operational capabilities, and consistently innovating. While transforming the organizational cost bases, leadership should focus on value rather than costs. Cost optimization plans need to consider achieving the more strategic, long-term options. These long-term options include pulling out from unworkable markets, business model innovation, robotic automation, or streamlining processes. These cost initiatives necessitate revisiting the strategy, costs, and, the way they align. Let’s talk 3 of the phases in detail. The first phase emphasizes on having a clear view of the Corporate Strategy and ensure that it is consistently understood across the organization. The commencement of strategic cost reduction endeavor demands developing a thorough understanding of the business strategy, operating model, and the investment on and revenues from the operations. The phase encompasses examining the expenditures and revenues of the business, evaluating the sustainability of the existing ventures; and contemplating the effects of disruption, changing customer needs, and competition from startups. There is also a need to comprehend the interfaces between different units and their associated costs, instead of merely utilizing industry benchmarks to gauge the viability of costs. The second phase signifies differentiating the strategically critical good costs from the non-essential bad costs. It involves segregating the good costs from the bad costs (avoidable expenditures), making informed decisions to improve the good costs, clearly articulating the current skill inventory and knowing the few critical competencies crucial to meet customer expectations and remain profitable. The phase demands distinguishing high-value priorities for investments, directing investments on creating winning capabilities, and developing plans to minimize bad costs. This can be done by undertaking organization-wide cost analysis to understand the type of projects being executed, their value, the expenditure critical to run the business, the transformation and automation opportunities, and how to realize the potential for improved savings. The next phase of the strategic cost reduction approach requires from the senior management to set the strategic direction and demonstrate Leadership support and buy-in. 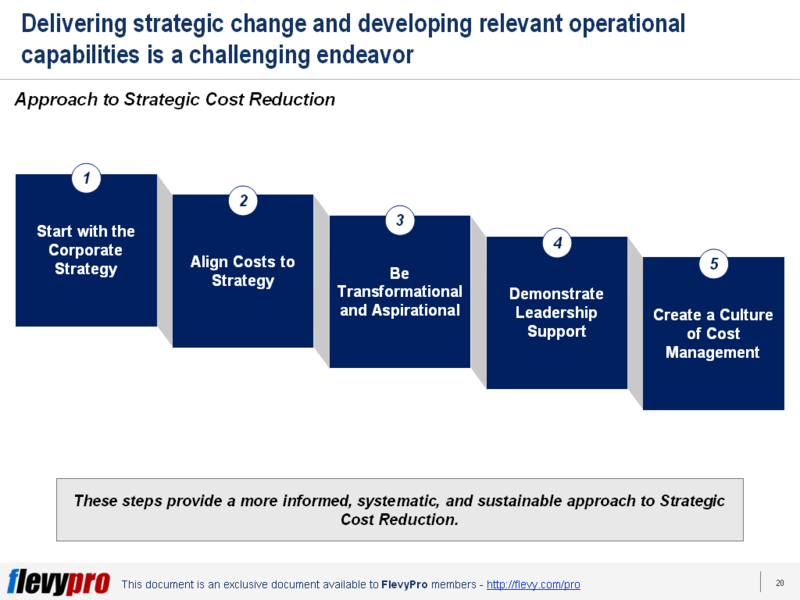 Leaders should treat the cost optimization program as a strategic business transformation initiative. They need to assign dedicated resources to the endeavor, guide teams, devote time, set governance and oversight mechanisms, and engage employees across the organization. It is critical for the leaders to develop ways to encourage organization-wide sense of ownership and partnership. Interested in learning more about how to implement Strategic Cost Reduction? You can download an editable PowerPoint on Strategic Cost Reduction Primer here on the Flevy documents marketplace.